Whirlpool goes on with its commitment for Habitat for Humanity following a new project in the Midwest, as part of Habitat for Humanity’s35th Jimmy & Rosalynn Carter Work Project. 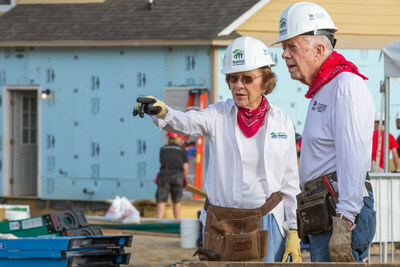 Habitat for Humanity’s Carter Work Project will see hundreds of volunteers – including former U.S. President Jimmy Carter and former first lady Rosalynn – working side-by-side with homeowners to build, repair or improve 41 homes as part of the project. In addition to supporting Habitat’s Carter Work Project, Whirlpool Corporation will be sending 75 employees to assist with the build. In more than 18 years of partnership with Habitat for Humanity, Whirlpool has developed active programs in more than 45 countries with a commitment of more than 107 million dollar. In the United States and Canada, the company has donated more than 191,000 ranges and refrigerators to new Habitat homes, serving more than 100,000 families.